This is a view of Glen Gordon, [Glen Gordon P.O.] 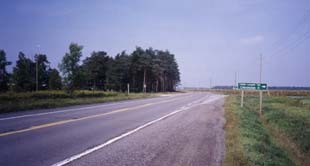 left side of road, on highway 34 looking north, to the right centre is 4th concession of Lancaster township. Glen Gordon, now just a grove of pine trees is about a mile north of Glen Gordon Station.